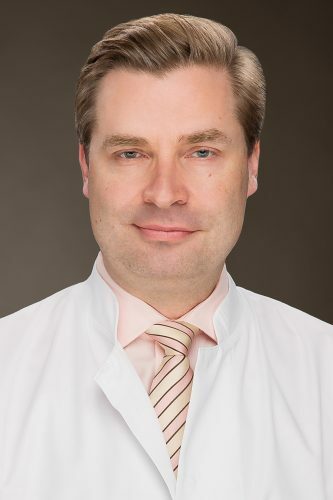 Dr. Clemens Esche is a board-certified dermatologist who graduated from The Johns Hopkins dermatology program and held faculty appointments at the University of Pittsburgh, the Mayo Clinic and at The Johns Hopkins University. Dr. Esche has received more than 10 academic awards for his pioneering research and has authored more than 70 publications. He is a thought after keynote speaker. Most recently, he delivered keynotes at the 2nd Euro-Global Congress on Melanoma and Skin Diseases on August 31th, 2017, in London, UK, and at the 13th International Conference and Exhibition on Cosmetic Dermatology & Hair Care on October 26th, 2017, in Paris, France. Dr. Esche was recognized with the Patient’s Choice Award in 2013 and became the National Winner of the Doctor’s Choice Award in 2014 and again in 2015. Dr. Esche has been featured in Marquis’ Who’s Who in Medicine and Healthcare and in Marquis’ Who’s Who in America. He serves on the Editorial Board of the Journal of Surgical Dermatology. Dr. Esche treats adult, pediatric and cosmetic patients and specializes in minimally invasive cosmetic procedures with little to zero downtime. Dr. Esche takes a holistic approach to improve the overall appearance as opposed to just focusing on certain lines and wrinkles. Convinced that ‘less is more’ Dr. Esche strives to achieve the most natural result possible. Dr. Esche has the perfect blend of extensive knowledge and compassion, making him an exceptional physician. He has my highest possible recommendation. Dr. Esche is a wonderful and caring physician. His immense knowledge of dermatology and general medicine has enable him to help many of our patients with difficult diagnoses. I would not hesitate to send one of my family members. He is a fantastic dermatologist. I had the honor of working with Dr. Esche in the past and I must say he is by far the best Dermatologist that I know. He is highly respected in his field and I referred all my patients in need of top Dermatologist to him. He certainly is a 5 star Doctor. Dr. Esche is a wonderful colleague who is always happy to share his expertise. Dr. Esche truly stands out amongst his fellow Dermatologists. He is admired and respected by colleagues as well as by his patients. Dr. Esche is a superb colleague with exceptional expertise in medical and cosmetic dermatology. Dr. Esche provides exceptional care for both general dermatology and cosmetic patients. I frequently turn to him for advice of any kind. 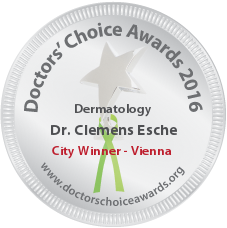 Dr. Esche is an outstanding dermatologist and an excellent researcher. I am very honored to know him, as he is also an incredibly caring mentor to younger physicians developing their careers. Dr. Esche is a professional, compassionate, highly knowledgeable dermatologist who goes above and beyond to ensure his patients get the treatment they need at a cost affordable to them. He is also involved in medical education in mentoring resident physicians. Dr. Esche is a superior dermatologist and person in every way. He is modest, hard-working and bright. Dr. Esche will be a credit to any community. Dr, Esche is a valuable member of the DermOne team. His patients’ reviews are always stellar. His patient care delivery is extremely comprehensive. I have known Dr. Esche for over 10 years as an accomplished scholar, very well trained physician, and excellent Dermatology colleague. I highly recommend him! I have enjoyed the experience of working with Dr. Esche for many years. He has excellent bedside manners and knowledge in dermatology and medicine. If you are looking for the best dermatologist in the greater Allentown area, he is the colleague to seek out. Dr. Esche is very accessible, kind, caring and totally committed to assuring his patients receive the best care available. He is in a league of its own. I had the pleasure of working with Dr. Esche during our dermatology residency at Johns Hopkins. Dr. Esche is a dynamic and hardworking dermatologist with a broad expertise in adult and pediatric dermatology. Dr. Esche carries himself with humility and with great personal and professional maturity at all times. As one of Dr. Esche’s attending physicians during his training at Johns Hopkins, I can affirm his enthusiasm, caring, calm efficiency and enthusiasm for the care of his patients. He was always a pleasure to teach and share in the care of the dermatologic patient. I have known Dr. Esche since I was a medical student at Johns Hopkins. He is not only a great scientist, teacher, and physician, he is also an exemplary doctor with true compassion and dedication. Dr. Esche is also a sincere and genuinely kind friend and colleague. He is a great doctor who is compassionate and easy to work with as colleague, he is team player and has the welfare of patients at heart. I have had the pleasure of knowing Dr Esche since his residency at Johns Hopkins. Not only is he an exceptionally capable clinician and scientist, he is also extremely kind to his colleagues. Great physician.He has great medical knowledge and bed side manners.i highly recommend him. Dr. Esche is an excellent dermatologist providing excellent skin care. Dr. Esche is excellant and compassionate physician whose priorities have always been his patients! Dr. Esche is an excellent dermatologist, very professional, and is sorely missed by the communities in which he has served here in KY.
Dr. Esche is an excellent clinician. His enthusiasm and kindness are evident in every encounter with his patients. His knowledge in his field is exceptional. He is a wonderful asset to this community. Dr. Esche is a wonderful, gifted and compassionate dermatologist, who is revered by his patients and very deeply respected by his fellow physicians in this community. It\’s been a privilege to work with him. His excellent training, enthusiasm and compassion for his patients make him a great addition to any community . Dr. Esche is the complete package as a dermatologist, kind and compassionate to patients and an expert in his field. We need more like him! 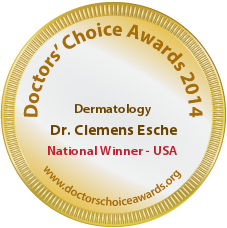 Dr. Esche is one of the most professional, caring and conscientious dermatologists I have worked with. He is simply outstanding, a category that is uncommon. I had the pleasure of knowing Dr Esche and working him for several years. He treated many of my patients as well as family members. He has a wonderful bedside manner and is extremely competent. I would not hesitate to recent end him to anyone!! I have known Dr. Esche since our medicine residency training days. He is not only very competent, but also very compassionate and caring towards his patients. A true patient advocate!! I would recommend him to any of the patients who are in need of excellent dermatology services, as much as I would recommend any of my own family to him. DR Esche has terrific clinical skills and medical knowledge along with extraordinary bedside manners. He is an excellent doctor. I highly recommend him. As Chairman of the Department of Dermatology at Dusseldorf University School of Medicine, I have known Dr. Esche since 1994. He is highly competent at patient management and very well liked among his peers and his patients. Dr. Esche is the type of resident that when he is on call one can sleep soundly knowing that he exercises exemplary judgment. He has received more than 10 academic awards and has authored more than 70 scientific publications. For all of these reasons, I am proud to recommend Dr. Esche most highly even though my pride is somewhat misplaced since I am not completely confident that we are responsible for his extraordinary development as a dermatologist. Dr. Esche is a very knowledgeable and professional dermatologist. He has always made himself available for the patients I have referred to him. He is compassionate and I have gotten excellent feed-back from my patients about him. Dr. Clemens Esche is one of the finest dermatologist I have known so far. I have the pleasure of knowing Dr. Esche closely. He is an eminent and highly experienced dermatologist. He enjoys a high reputation in the field of dermatology. Dr.Esche is a superior dermatologist and person in every way. He had a lot of knowledge to share. I have known Dr. Esche since our days training in dermatology at Johns Hopkins. He is a physician-scientist who is capable of translating intensive research and knowledge of the skin to patient care in the clinic with facility. Not only does he excel in scientific contributions, he is also a wonderfully genuine and compassionate friend and colleague. 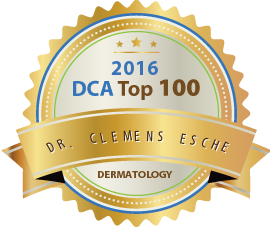 The field of dermatology is fortunate to count Dr. Esche as one of its members! As Chief of Staff at PMC, I always received great reviews from fellow physicians and patients about Dr. Esche, while he was practicing in the Pocono area. 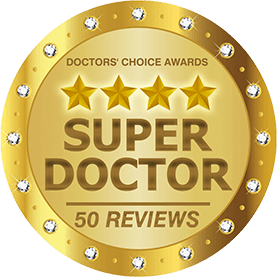 I am writing in the strongest support of Dr. Esche for the Doctors Choice Award. Dr. Esche’s commitment to patient-centered care and his level of professionalism are more than deserving of accolades. He is clearly the most compassionate and caring dermatologist I have worked with. Dr. Esche’s reviews by his patients are exemplary. Dr. Esche is an extremely well rounded colleague with diverse interests in clinical dermatology and in dermatological research. I have had the opportunity to supervise Dr. Esche from 1996 to 2001 and also to serve as a mentor for him until today. Dr. Esche joined my research laboratory in 1996. His most important observation is the ability of essentially every murine and human tumors, including melanoma and lymphoma, to induce premature programmed death of immune dendritic cells. Dr. Esche has also demonstrated that activation of dendritic cell precursors in mice using recombinant human flt3 ligand results in heightened antitumor immunity and inhibition of melanoma and lymphoma progression. The results have been translated in a phase II study of flt3 ligand in metastatic melanoma patients. On a personal level, Dr. Esche has also been consistently outstanding. The postdoctoral fellows who were his seniors at the time he joined us were only too happy to find out that Clemens had been assigned to us. Dr. Esche’s personality makes him a leader to his peers, while, at the same time, making them feel comfortable and desirous of emulating him. In summary, Dr. Esche has independently and very successfully pursued a line of investigation into immune cells beginning well before the current vogue in the biology of specific cell populations in the tumor microenvironment. Dr. Esche’s performance in every single category since joining my laboratory has been no less than outstanding and continues to surprise me until today. I am a primary care physician in the Pocono area where Dr Esche was in practice for several years. Over that time, he saw many of my patients including my wife. The care and treatment were superb. We miss him here. Dr. Esche is very accessible and has proven to be an excellent source of information specifically on my most difficult dermatology cases. I always find myself adopting his recommendations. Dr. Esche is top-notch. I know Dr. Esche since 1986. He is an excellent and broad experienced dermatologist. I am practising in Germany but in difficult cases I appreciate very much the advice and consultance of Dr. Esche which was often very helpful for me. Dr. Esche is an outstanding personality. I am very happy with this colleague and friend. I am sure you will agree that those of us who are asked to write many recommendations can sometimes find the task quite tedious and even boring. However, when one is asked to write about a truly deserving colleague, the task becomes almost pleasurable. Such is the case now when I write to you on behalf of Dr. Esche. He is simply DA-DERMATOLOGIC-BOMB. 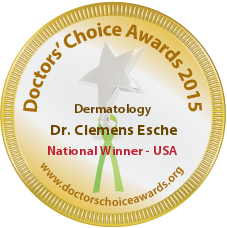 Dr. Esche provides the very best in comprehensive dermatological care. My own experience was fabulous. I know of someone who flies in from Europe to see Dr. Esche. You will not find a better candidate for the award. Dr. Esche was our internal medicine intern before derm took over. A great help in looking at clinical correlations with skin and internal disorders! Glad he is back in town. Dr Esche is a well known dermatologist, compassionate and caring. I wish him good luck. Dr. Esche is an great physician with excellent diagnostic skills. I would highly recommend him to any patient in the area in need skin care. Dr. Esche’s clinical acumen is magnificent. My job as a pathologist was greatly simplified by having the pleasure of working alongside him. I had the pleasure of working with Dr. Esche. He is very professional, excellent dermatologist, and a very kind and caring physician. Great colleague to have around. We miss him! I have known and referred patient’s to Dr. Esche for many years. He has always provided expert and compassionate care. Excellent doctor and great researcher! I have known Dr. Esche since 2005. A true professional. One of a kind. Dr. Esche is an excellent dermatologist and is well respected in the medical community. I’ve known Dr. Clemens Esche to be a very thorough, knowledegable and compassionate person; and I trust that this will be very beneficial to all his patients. Dr. Esche always provides amazing care to my patients. He treats the whole person and his medical knowledge is encyclopedic. Dr. Esche is a great doctor he took care of my patients when he worked in Poconos My patients loved him ! he knows his subject very well! When my close friend and a family member needed a dermatologist , I reached out to Dr Esche . And I would do it again . Enough said . 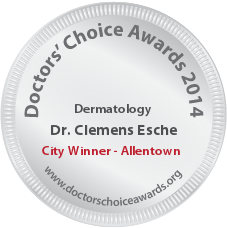 Dr. Esche is a great dermatologist that is missed by his patients in the Pocono. Very professional and committed physician! Excellent dermatologist with very good clinical skills! He has all the essential traits of an excellent dermatologist! He is greatly missed by his patients and friends in Kentucky ! Dr. Esche is an excellent and a very talented dermatologist with abundant knowledge. A very caring and efficient doctor. An excellent physician. Excellent dermatologist. Has a lot of experience and a great find of knowledge in his field of practice.